I believe that the answer is 48. Interesting puzzle. Lets assume this is standard Maths. So 3 x Horse = 30; 1 x Horse = 10; Horse = 10. And Horse + 2 x Horse Shoes = 18; 1 x Horse Shoe = 4; Horse Shoe = 4. And Horse Shoe – Boots = 2; Boots = 2. Now for the tricky part, because it depends on how they teach you to use a calculator and that is country dependent the moment. Boot + Horse * Horse Shoe = 2 + (10 * 4) = 42. And this would be my answer. And it uses the BODMAS rules of mathematical operator precedence and assumes you put the formula into the calculator and hit the equals sign at the end. Boot + Horse * Horse Shoe = 2 + 10 * 4 = 48. This comes from 2 + 10 = 12. 12 x 4 = 48. So if you are taught to hit equals after each step of the equation, this would be your answer. There was a time Maths was considered a universal language. All the pictures give us an indication that we must concentrate when we try to solve a problem. OK. 1 Horse is 10, 2 horseshoes is 4, one horseshoe is 2, 2 boots is 2 so 1 boot is 1. 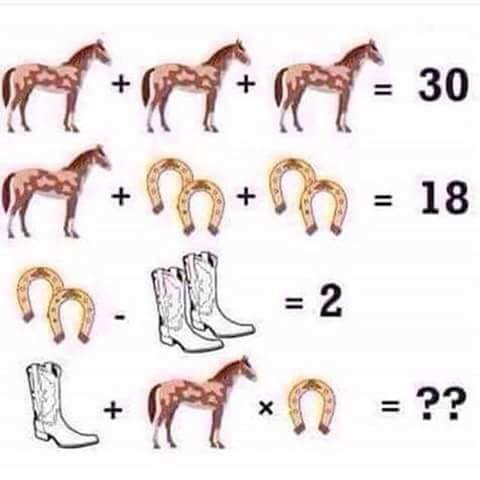 1 boot plus 1 horse is 11 times 2 (1 horseshoe) is 22. I think the answer is thirteen. So many stupid answers here. Cannot believe it.